We are one of the well known Manufacturers and Suppliers of Le-Chatelier Mould, which has been fabricated in accordance with IS: 5514. We produce these Le-Chatelier Moulds using excellent quality raw materials to ensure durability. The Le-Chatelier Mould is used for soundness test of cement. The apparatus comprises of a small split cylinder thereby making a mould of 30mm internal dia. and 30mm high. On both side of the split cylinder, two parallel indicating arms having pointed ends that are fixed. 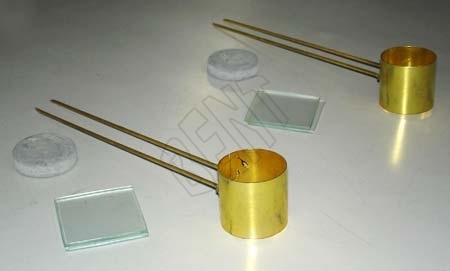 Further, the mould is supplied with lead weight and two glass plates. A set of six molds is offered in a cardboard box with the unit.